In the long run, a company's stock price depends on the "fundamentals." How profitable a firm is and how well it gains and maintains market share and growth in revenue and earnings ultimately determines the stock's worth. However, over short time periods (days, weeks or months) most stocks tend to follow trends that shift back and forth. Analyzing these trends and trading the stock accordingly is the "bread and butter" of the short-term stock trader. The stock chart is among the most important tools for these traders, and knowing how to read stock charts is vital. Print out a sample stock chart to examine (see "Additional Resources," below). Stock charts can be set up on a daily, weekly or long-term format, but they all follow the same basic plan. Start at the top where you will see the stock symbol and date of the chart. Also at the top are the day's high, low, and closing prices and the volume of shares traded. Look just below the top line of information. You will see an entry that says MA(30), MA (60) or some other number. This is the moving average. It is the average price of the stock over recent past. The number in parentheses tells you how many days the moving average covers. At the very bottom of the chart there should be a bar graph. This gives you the volume of shares traded each day the chart covers. Examine the main graph between the top and the volume bar graph at the bottom. Each day's trading is usually represented by a short bar or "candlestick." The top of the bar indicates the high for that day and the bottom the low. If there is a graph line passing through these bars, it indicates the closing price. Notice which way the graph of the stock price is pointed. If it is headed toward the upper right corner, the stock is in an upward trend. If it's pointed at the bottom right, it is in a downward trend. Sometimes the graph doesn't seem to be moving one way or the other, and traders call this a period of consolidation. Understand the function of a stock chart. The point is to spot trends early so you can buy early in an upward trend and sell early in a downward trend. Traders use a number of indicators to do this. For example, look for price supports. A price support is a price below which the stock rarely drops. When it approaches the price support, it's likely to reverse the downward trend and start moving up. A price resistance is the same thing in reverse: a price the stock falls short of. If it gets close, the stock price tends to reverse direction and decline. 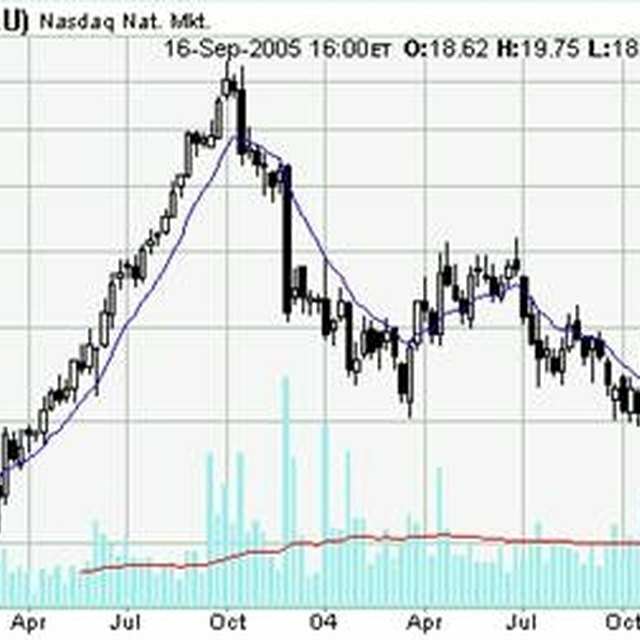 There are many online resources that provide stock charts or allow you to create your own. Most major brokerage firms make these online tools available to traders. Don't neglect to pay attention to news affecting a company whose stock you are trading. A fall in profits or the introduction of a new product line can start the stock moving in a way stock charts can't predict. Long-term investors should make use of stock charts. While you may plan on holding a stock for years, it makes sense to buy at as low a price as possible. Using stock charts and trend analysis can help you spot when a stock you are interested in is selling at a particularly good price.